Junior Jenny Reed has been studying Spanish since the eighth grade. A junior biology and Spanish double major from Denver, Colo., she decided to continue her work in the language by spending her spring semester at the University of Salamanca. 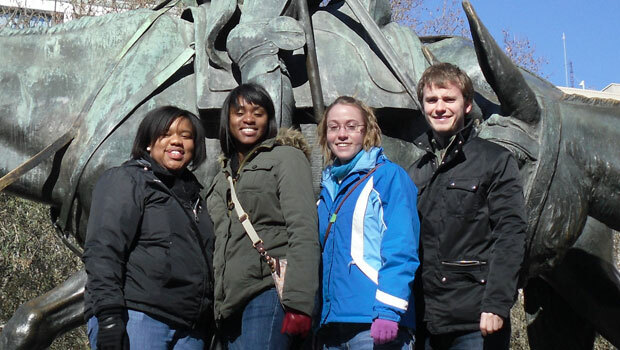 Reed says studying abroad was the next logical step to advance her education. “The opportunity to live with a local family was the selling point of the Salamanca program for me,” she says. What are you studying and what are your classes like? My classes cover art and architecture, business, film and contemporary Spanish culture. I’m also receiving credit for an internship in the University of Salamanca’s International Relations Office. All our classes are taught in Spanish by professors from the University of Salamanca, with the exception of one, which is taught by Wake Forest Spanish professor Candelas Gala. What did you do your first day in Spain? I took a walk to the Plaza Mayor, a large square in the middle of the city and the center of Salamanca’s social activity. There, a group of musicians were playing traditional instruments and wearing regional clothing. A crowd formed around them and the townspeople who had been out for an afternoon stroll started to perform traditional Spanish dances. The genuine enthusiasm of the crowd during this impromptu dance festival assured me that I would enjoy the semester to come. 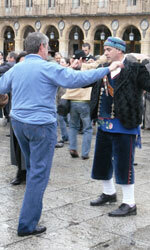 Citizens of Salamanca perform traditional dances in Plaza Mayor, Salamanca’s main public square. My first and most impressionable experience had to be my first meal in Spain. I sat down at the table with my new family and struggled to eat the most gigantic bowl of spaghetti I had ever seen in my life. When I finally finished, I smiled and thanked them for my meal, silently congratulating myself for having challenged the dimensions of my stomach to its limit. My Spanish grandmother cleared the bowls from the table, and just when I thought I was free, she reemerged from the kitchen with “el segundo plato.” I had heard tales about the Spanish lunch before but hadn’t understood its magnitude until I was faced with the challenge of consuming one. After two pieces of baked chicken with tomatoes, fruit, coffee, Christmas sweets and a piece of cake, I had finished. Everything was delicious, but my range of motion was limited for the rest of the afternoon. What has surprised you about the trip so far? As a student from the U.S., I learned history from a textbook. But Spain is living evidence of how history molds a community. My host grandmother can tell you exactly what she was doing during the attempted coup d’etat in 1981. I had not anticipated this kind of confrontation with history, but it is remarkable to hear about it from the very people who were there. Complete immersion in the Spanish language is arguably the most valuable aspect of the Salamanca program, but it is also the part that causes the most frustration. Sometimes I rehearse what I’m going to say before performing menial tasks, like asking for directions or ordering food at a restaurant, and sometimes it gets tiring to concentrate so intently to understand simple phrases. This semester in Spain has been a humbling experience. Living in a foreign country and being a guest in someone else’s home has made me more aware of the social and cultural consistencies I accept as standards in the U.S. I have learned, however, that it is good to be out of your element. Some of the experiences during which I learned the most were those in which I felt the most uncomfortable. I have gained confidence in forging unfamiliar territory and have learned that the value of an experience amounts to the effort you expend. There is a language exchange program through which Wake Forest students are able to meet with members of the local community to practice speaking Spanish in an informal atmosphere. Before this semester, I would have been terrified by the idea of meeting for coffee with a random stranger, but I have come to realize that if you’re willing to put yourself out there, the rewards are gratifying. What advice do you have for students studying abroad? Seize control of your own experience and make every effort to integrate yourself into the society and country in which your studying. There are countless opportunities as long as you are willing to look for them. In Salamanca, the group of Wake Forest students volunteer at the local YMCA to help Spanish children with their schoolwork. Our program also offers a series of cultural activities that include wine tastings, cooking lessons, poetry readings and traditional Spanish dance lessons. What three things would you like to do in the time you have left? During my last two months in Salamanca, I hope to visit the Civil War archives museum, have a picnic in the Plaza Mayor, and see a traditional Flamenco dance performance. My host mother told me I will know I’m fluent when I start to dream in Spanish, so I hope that happens, too. Wake Forest’s spring class of 2011 with Salamanca’s Mayor, Sr. Don Julián Lanzarote after signing an agreement of collaboration between the city of Salamanca and Wake Forest University.